I want to show you these terrific sterling silver beads that I received recently from Auntie's Beads. 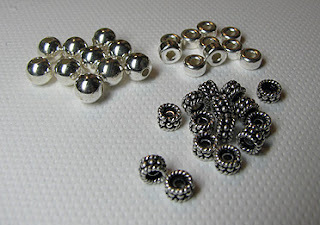 They have a very good selection of silver beads in general, and an especially nice variety of spacer beads. While there are some instances in which I will use plated metal beads, I really prefer the real thing whenever possible. Since sterling and fine silver can run you into a chunk of change, I was happy to see that the Bali style beads are available individually. The other two styles can be bought in small quantities, so if you are hoping to make a single piece, you won't find that you've just spent your entire bead budget on nothing but spacers! I've got a couple of pieces in mind that I think these spacers would look good in...stay tuned! As regards FTC disclosure guidelines: I have received sterling silver beads free of charge from Auntie's Beads in order to write a review and/or create a project free of charge for you. I have not been paid for my endorsement as it pertains to the products received. I have some of those Bali spacer beads and just love 'em. They dress up anything you add them to. Both the rounds in various sizes and the Bali beads are soooo versatile!